Durham and Orange counties’ light-rail project has been discontinued as of April 2019. All information about the project is now outdated but available here as part of the historical record. Light rail is a transit technology that uses lighter rail cars than traditional passenger rail systems like subways or commuter rails. Light rail operates in dedicated tracks with electrical power supplied from an overhead catenary system. The light-rail vehicles are designed to operate in mixed traffic or in an exclusive right of way, either at grade or on an elevated structure. Light rail has benefited several American cities, such as Seattle/Tacoma, Minneapolis/St. Paul, Charlotte and Portland. Why do we need the light-rail project? For our community to continue to grow and maintain our enjoyable quality of life, the Triangle needs a high-quality interconnected transportation system. 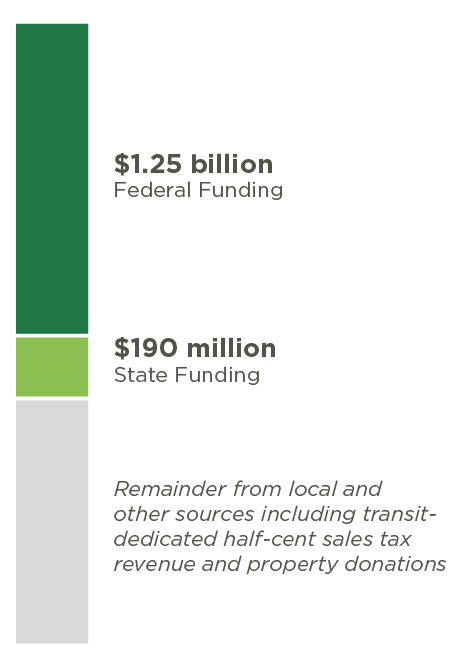 Planning for high-capacity transit in the Triangle region began more than 20 years ago, and several studies have been conducted to advance major transit investments in the area. That work included extensive coordination with stakeholders and members of the public to develop, evaluate and refine the range of alternatives. Those studies identified the corridor between Durham and Chapel Hill as one of the highest-priority corridors for transit investment. Even under current demands, the roadway network and transit systems between Durham and Chapel Hill are beginning to strain. Congestion continues to increase, and as more people move to our area, all residents and visitors will experience increased travel times and sprawl compromising our open space and rural areas. This project will connect residents to many of our area’s top employers, provide access to high-quality medical care and educational opportunities and help our local governments prepare for growth by fostering compact development along a high-capacity transportation network. Why does the project not serve RDU International Airport, Research Triangle Park, Raleigh, or Wake County? Transportation studies showed that a continuously connected rail line to RDU and RTP would not be warranted or cost effective based on estimated demand. RTP has a significant number of jobs, but they are widely distributed compared with those in Chapel Hill and Durham. This dispersed development pattern is not conducive to rail service. Wake County is also planning for transit by evaluating potential transit corridors. For more information, please see www.GoForwardNC.org. How was ridership forecast for the project? Ridership forecasts were developed using the Triangle Regional Model. Minor changes to inputs (travel speeds or times, number of residents or employees, etc.) do not always lead to changes in the output (ridership, travel times, etc.) for specific projects like the light-rail line. The Triangle Regional Model was developed by the Triangle Regional Model Service Bureau in cooperation with regional stakeholders Durham-Chapel Hill-Carrboro Metropolitan Planning Organization, Capital Area Metropolitan Planning Organization, NCDOT and GoTriangle. The model is designed to forecast travel throughout the Triangle region’s transit and roadway system. As such, it contains a network of existing and planned future transit services consistent with the 2040 Metropolitan Transportation Plan. In general, the project is not expected to have a significant effect on traffic on nearby roadways. However, the project will provide a competitive and reliable travel alternative to the congestion on these roadways, particularly during peak traffic hours. How do I know whether my property is impacted by the project? Directly affected property owners, owner’s representatives and/or tenants will be notified in writing of GoTriangle’s interest in acquiring the property and of the basic protections provided by law. What do I do if my question is not listed here? Please contact our Public Involvement team at lightrail@gotriangle.org.